TenMarks Math has aligned content standards by grade level, which makes it easy to provide whole class, blended, or small group instruction. TenMarks Math Assignments provide standards-aligned, rigorous math practice, which can be used to introduce or review concepts. TenMarks Math Lessons provides teachers with a comprehensive set of resources to guide effective instruction for each math standard - contextual overview, learning trajectory, ideas to assess readiness, and lessons for foundation, core instruction and enrichment – for use before and during class, accessible on any device, anytime. As a teacher, I feel that immediate feedback is extremely important. One of the best features of TenMarks Math is that it gives instant feedback to students regarding their correct or incorrect responses. It also gives an explanation using pictorial representations, which are great for those visual learners. If a student does not understand a certain topic while doing a TenMarks Math assignment, there is a video that explains the math concepts with many visuals. These videos help to review or reinforce content material. Throughout the year, I noticed many students watching the videos to grasp a better understanding of the concept that was presented to them. If a student has difficulty with a concept while doing their TenMarks Math assignment, they have the option of clicking on a hint on the right side of the screen. A student can use up to three hints per question. The hints are scaffolded. So, the first hint starts out very basic. Then, the second and third hints gradually become more detailed. The hints do not give away the entire answer. So, this feature is great for those students who need more assistance or remediation. Many states have opted for computerized state testing. So, it is important for the students to be more tech savvy. By using TenMarks Math, I noticed that the students felt more comfortable completing math problems on the computer. TenMarks Math gives students the opportunity to see different types of math problems. In addition to basic types of problems, like multiple choice, constructed response, and checkboxes for multiple answers, the assignments also offer interactive questions, such as drag and drop, graphs for plotting geometric figures, and classification tables for sorting different objects. So, using TenMarks Math is a great way to familiarize students with a computer-based test. As the students complete assignments, they earn coins that they can later use at TenMarket. In TenMarket, students can play 10 games. Some of these games include Bounce Prediction, Taxi Pickup, Sky High, Cheese n Mouse, and many more. Students can also view the certificates that they have earned by completing different assignments. This is a terrific way to motivate students! TenMarks Math has a free mobile app that works well on iPads and other mobile devices. This year, I used the mobile app more than the desktop version. The students enjoyed using their iPads because they were able to move around and collaborate in an effective manner. Throughout the year, I have used TenMarks Math in a variety of ways. At the beginning of the year, I used it mostly as review. As the year progressed, I used TenMarks Math to introduce new concepts and to challenge students with new concepts. I also held contests with Jam Sessions. The students absolutely loved this! I set the timer and allowed the students to pick a math concept. The students then completed as many problems as they could within the allotted time. The students were rewarded based on how many questions they answered correctly within the allotted time. The Report tab in TenMarks Math dashboard provides access to instant data. Teachers can easily locate percentages on assignments and jam sessions. The data is color coded and separated by content standards and dates completed. 10. It is completely free! TenMarks Math is free to all teachers. TenMarks Math Premium can be purchased for extra features including standards-based and grade level assessments, one-click differentiation, and real-time interventions. Visit the website to learn more about TenMarks Math Premium. Overall, I feel that TenMarks Math made a major impact on my students’ math achievement this year! Sign up for free at TenMarks Math! As I write this post, I am sitting at Firestone getting my tire fixed. While waiting, I think to myself that if I didn’t have bad luck, I would have no luck at all. I am on my way to the beach to soak up the sun and celebrate my 15th anniversary with my wife. The problem is that this is the second flat tire I have gotten in two weeks. This is definitely not the best way to celebrate my 15th anniversary! Also on my mind is school, because it starts at the beginning of August. Most of you know that technology is a big part of my classroom. I feel as though many teachers get “technological flat tires”. What I mean by this, is that most teachers start with an open mind with using technology within their classroom, but many give up very easily when something goes wrong or doesn’t work quite right. Then they proceed to share their thoughts of disbelief with their students and coworkers. This starts a bad cycle of negativity. What I have learned throughout my years of teaching is that my students have achieved more with the infusion of technology into my classroom. When I first started using technology within my classroom, it didn’t always work the way that I wanted it to. In fact, it still does not always work the way I would like it to. At times it can be frustrating, but I always embrace the opportunities the technologies will create for my students. 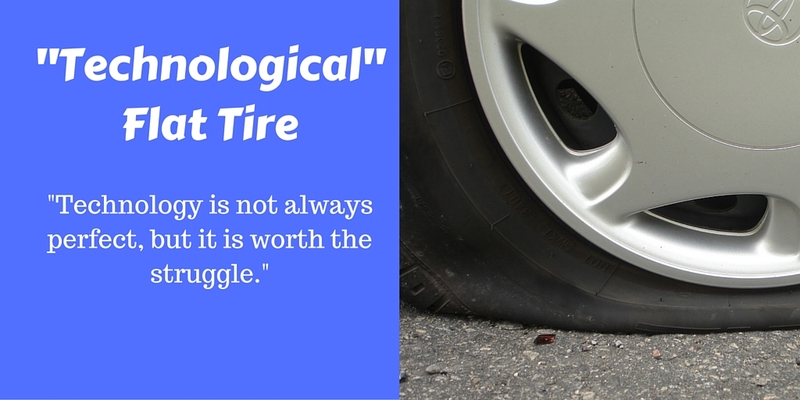 As comparing this to a metaphorical tire, you can either simply mend the puncture in the tire or get a new tire altogether. This goes right along with our mindset on technology. We can either find a quick easy fix or grasp a new mindset altogether. If we do not take the time to grant students the opportunity to use technology, we will not allow them the opportunity to reach their full potential. Now that I am sitting in the sand and listening to the crashing waves, I realize that maybe that flat tire was not such a big deal after all. The end result was well worth the inconvenience. Looking for ways to increase student engagement in your classroom? Try these game-based educational apps that make math a whole lot of fun! 1. Operation Math (Spinlight Studio) - James Bond meets math facts. With this app, students will travel around the world, trying to defeat Dr. Odd. Students will complete timed missions in addition, subtraction, multiplication, and division. When completing these missions, students can earn different types of watches and uniforms. Operation Math has over 100 different missions that the students can complete. 2. Quick Math and Quick Math+ (Shiny Things) - Students really enjoy Quick Math and Quick Math+because they can use their finger as a stylus and just write the answers on the screen. In Quick Math, students are given the option of doing addition, subtraction, multiplication, and division. Quick Math+offers more challenging activities that test memorization, estimation, and indices. 3. YodelOh Math Mountain (Spinlight Studio) - This app, reminiscent of The Price is Right game show, takes place in the Alps. The objective is to answer as many fast facts as possible before falling off the mountain. If a student answers a problem correctly, they move closer to the summit of the mountain. As the students are completing math problems, they also have to watch for sheep trying to knock them off the mountain. This fast-paced, interactive game holds student interest by putting a twist on the memorization of fast facts. 4. Factor Samurai (Third Rail, LLC) - This app helps students decipher between prime and composite numbers. Factor Samurai puts a different spin on the game Fruit Ninja, but instead of slicing fruit, the students must slice composite numbers into prime numbers. Students can earn different colored swords by slicing only composite numbers. This app also challenges students by giving them three different levels to choose from: grasshopper, apprentice, and master. 5. Math Bingo (ABCYa!) - Math Bingo uses all math operations: addition, subtraction, multiplication, and division. Students can get a bingo by correctly answering math facts presented vertically, horizontally, or diagonally on a grid. When a student completes a bingo, the app unlocks games such as “Bingo Bug Bungee,” “Math Stack,” and “Math Fling.” All of these games help students learn math facts in a unique way. 6. Math Planet (Playpower Labs, LLC) - Math Planet offers math apps for first through fifth grade while also providing a middle school app. Students can explore different planets and solve problems related to number sense, fractions, decimals, geometry, and all of the math operations. Math Planet is a fun way for students to learn math skills! 7. Math Slicer (Thumbstorm, LLC) - Math Slicer is a great way for students to learn their math facts. Students slice the answers to addition, subtraction, multiplication, and division problems. As a math problem appears on the screen, two answers fly though the air and a student must "slice" the correct answer with their finger. 8. iTooch Math (eduPad) - iTooch is based on the Common Core standards and covers mathematics, science and language arts for grade 1-5. With this app, students can take practice tests and earn grades for each of the content standards. This app offers a multitude of visuals to help students gain understanding of the content. 9. GeoBoard (Clarity Innovations, Inc.) - This app creates a digital geoboard. Students can create geometric shapes with different colored rubber bands. The boards are shaped in squares, rectangles, and circles. This app can be used to illustrate polygons, to identify types of angles, and to create congruent figures. 10. Slice Fractions (Ululab) - If you are looking for a fun way to learn or teach fractions, then Slice Fractions is for you. Slice Fractions involves a world-traveling mammoth trying to solve different math problems related to fractions while collecting interesting hats along the way. This app includes puzzles that incorporate fraction symbols, fraction parts, comparing fractions, problem solving, and adding fractions. This is a well-constructed app that's perfect for 5- to 12-year-olds. 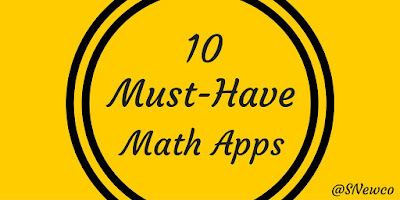 Try these apps to keep students engaged and motivated in math through the last weeks of school. Be sure to let us know how it goes in the TenMarks teacher communities on Facebook and Twitter!